Strawberry shortcake is good, but I think a bit overdone. When I was at the farmer's market a few weeks ago, these fat little peaches were calling my name! I found out that they are called "doughnut" peaches and they were so fragrant and sweet, that I recommend that you try to find some! I took them on a trip to my parents' house in Pennsylvania. I told my mom that we were going to make a boozy recipe, so I asked her what type of alcohol she had on hand; she only had a half-bottle of amaretto. Now, there are worse liquors to be stuck with and it just so happens that peaches pair INCREDIBLY well with amaretto. Lucky for us! In a food processor, combine the sugar, flour, baking powder, salt, baking soda, cinnamon, and nutmeg. Pulse this mixture with the coconut oil until it resembles a meal. Add the amaretto and milk and continue to pulse. Wrap the dough in plastic wrap and refrigerate it for 10-15 minutes. Take the slab of dough and flatten it out with your hands or a rolling pin. (If the dough it too hard, grease your hands with coconut oil and knead the dough.) 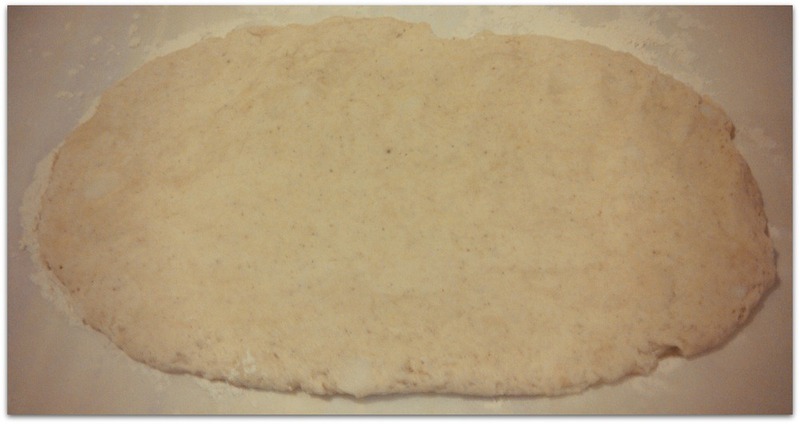 Flatten the dough to about a half-inch in thickness. Cut the dough into circles and place them on the baking sheet. Bake them for about 15 minutes. In a small saucepan, combine the filling ingredients - except for the amaretto - and cook on medium heat until peaches are soft. As you take the filling off of the stove, stir in the amaretto. These shortcakes are not overly sweet, but satisfy your dessert craving! A perfect summer treat!